Last summer, I asked three-time Olympic gold medalist Georg Hackl if anything less than victory in luge is acceptable to his native Germany, the sliding sport’s unequivocal ruler. He laughed before I could finish my question. “What we do is sport,” responded Hackl, who is currently in Pyeongchang coaching Germany. “I know how difficult it is to be successful in sport and not just for one race, just for a few races, for a few years even. This always a lucky thing. The word “forever,” as Hackl puts it, can be read as the decades of German dominance in luge, across all disciplines. But in a sport where margins of victory can come down to the thousandths of a second, forever can also refer to a notably smaller increment of time. Heading into the fourth and final run of Sunday’s men’s singles event, the working definition of forever was .192 seconds—that was the cushion that German luge legend Felix Loch had over second-place American Chris Mazdzer. The two-time defending gold medalist was looking to match Hackl’s haul, and with another clean run he would almost certainly do so. My definition of forever in luge is something in between: the amount of time Loch spent between his third run and his last descent down the icy track at the Alpensia Sliding Centre. As the 28-year-old waited with his ample lead, 39 sliders completed their third runs. Then Loch’s 19 closest competitors took their final runs in reverse order of standing. About two hours had elapsed between Loch’s runs. This goes beyond “icing the kicker” territory—it was something like sticking a brilliant approach shot on the 18th green, then waiting two hours to strike the putt. Mazdzer, Loch’s closest competitor heading into the final run, was an unlikely threat considering his FIL World Cup results heading into Pyeongchang. After a third-place finish in 2015-16, the American didn’t reach a single podium during the next two seasons. But with no pressure on him besides what he put upon himself, Mazdzer finished the first day of racing in fourth place, just .001 outside the medal positions. 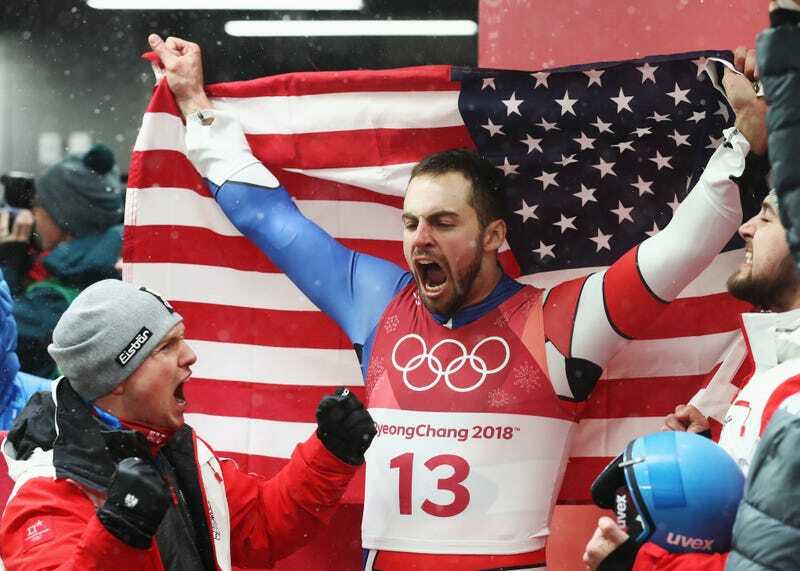 On his third run the next evening, in frigid conditions—which Mazdzer, who grew up just outside of Lake Placid, says he is fond of—he threw down a track record time and move into second place. To anyone who follows luge, or follows Mazdzer on an Instagram account that would make fellow globetrotter Anthony Bourdain proud, it was a joyous moment, regardless of how he would finish. Mazdzer hides nothing, on the track and off, and is happy to bare his soul to anyone who has an internet connection. “There comes a point where giving it everything you have and believing in yourself starts to fade away and I am almost to that point,” he wrote on January 21. Loch’s time had almost come, but Mazdzer’s final run would come first. Just before putting his face shield into place, the veteran smiled and let out a long and visible exhale into the cold, snowy night. It was the only evidence of joy during this tense stretch of racing. When Mazdzer navigated the course’s treacherous curve 9 without error, NBC announcers Leigh Diffey and Duncan Kennedy screamed in amazement. The new and technically challenging track had crossed up some of the world’s best sliders, but Mazdzer emerged unscathed. He crossed the finish line with an aggregate time .026 short of Austria’s David Gleirscher, but behind no one else, assuring the U.S. its first men’s singles luge medal ever. There was much for Loch to think about since he last slid, and Mazdzer and Gleirscher had given him more to ponder. Finally, it was time to go. And finally, the unflappable German fell victim to curve 9, striking the wall slightly, just enough to send his sled skidding sideways. Luge is cruel this way; it was enough cost him a chance at victory. Watching at home, it took me a few seconds to realize that Mazdzer had upgraded his bronze medal to silver—Loch’s mistake was that jarring. It was a result that “the luge world will be left speechless,” heralded NBC announcer Diffey. It’s not a phrase you hear very often, but it was exactly right in this case. Mazdzer, ordinarily a man of many words, was simply left to smile. Senior editor of TENNIS Magazine and TENNIS.com for 10Ten Media.